You can create tasks from existing nodes of your mind map. This procedure is most suitable when you have created the mind map following the task-based approach. Which means the main nodes of your mind map correspond with the tasks of the project (Bottom-Up). 1. Open an existing project or create a new one. 2. To open an existing mind map click on Mind Maps on the Start tab. All Nodes: All nodes of the mind map including the main node are transformed into tasks. The tasks are automatically transferred to the task area of your project. End Nodes: Only the end nodes of your mind map are transformed into tasks. Those can be accessed in the task area of your project later on. Selected Nodes: First choose the nodes in the mind map, you want transform into tasks. Afterwards click on Create Tasks and then on Selected Nodes. 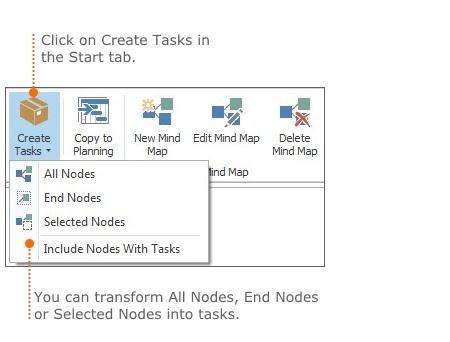 Include Nodes with Tasks: Select this option to once again create tasks from nodes, which have already been transformed. 3. After you have selected an option the Task page with the new tasks automatically opens. The tasks that have been transferred from the mind map are marked with a mind map symbol. In the mind map all nodes that already have been transformed into tasks are marked with a task symbol. For more information, on how to add important information to tasks, see Create and edit tasks. Create tasks from a mind map • Copyright 1999-2019 © InLoox, Inc. All rights reserved.